India today is no longer just a holiday destination where travellers roam like nomads from place to place. With the growth of tourism industry, over the years, India has witnessed travellers from different parts of the world coming here for a medical and wellness holiday OR yoga and meditation holiday. The country, being a hub of countless medicinal plants and home to several spiritual leaders, has emerged as one of the Ayurvedic centers in the world AND thus influenced the tourism industry to facilitate tourists outcoming with Spa and Ayurvedic resorts in India. 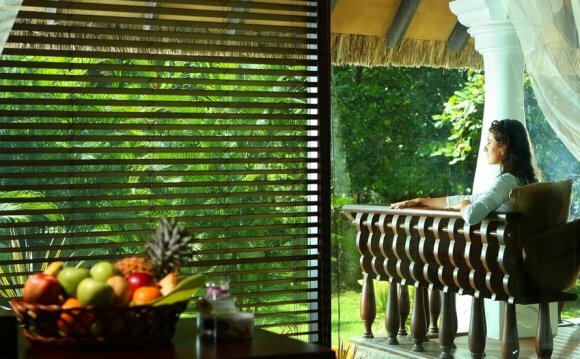 Here is a list of top 11 Spa and Ayurvedic Resorts in India that will drive you from the best of body therapies to luxury retreat in the midst of nature freshness. Atop a hill at an altitude of 2, 580 meters and tucked in the midst of 22 acres of lush green landscape that is dotted with pine and cedar trees, Wildflower Hall, Shimla is no doubt a one stop retreat. With perfect interior, wood paneling and original artwork, displaying the grandeur of the colonial era and amenities that mark the modern trend, the property simply burst out a fusion of quaint charm and contemporaneity. Besides the terrace restaurant, Cavalry Bar and 85 rooms – deluxe garden view rooms, premier garden view rooms, premier Mountain View rooms, deluxe suites and Lord Kitchener suite, Wildflower Hall boast off the classic Oberoi Spa… redefining ultimate luxury and holistic Ayurvedic treatment. One can unwind himself with the array of massage, revitalizing body and Ayurvedic therapies that are available here, embark on a luxury journey by taking specialty baths and yoga sessions and even relive at the outdoor whirlpool. Nonetheless, the award winning property – Travellers’ Choice Award by Trip Advisor – is a perfect hideout for honeymooners where one can frame myriad quixotic memories. Perched at an elevation of 2, 003 meters, The Himalayan, reviving the Victorian Gothic style of architecture amid the potpourri of nature… is yet another luxury retreat for travellers seeking intimacy and peace. The Castle, which is build with antique and classy interior including cast-iron fireplaces and hand-carved Gothic chimneypieces, houses The Parlour (a communal dining hall), Dungeon bar and guest chambers having en-suite marble bathrooms with shower cubicles, bathtubs, vanity mirrors and bath amenities. Further, from the Crow’s Nest one can simply capture the travellertrap panorama of Manali and cascade of snow clad mountains beyond the lush green rolling hills. Moreover, besides modern amenities and classic exterior, the cottages bring forth a contemporary stay. To step into the world of profound contemplation of an abstruse nature, The Himalayan Spa offering host of massage and Ayurvedic therapies is a haven of indulgence. Overlooking the swimming pool and orchid garden, the Spa centre is a place where one can spend ideal hours and enjoy the wide verity of top notch amenities and commendable services.